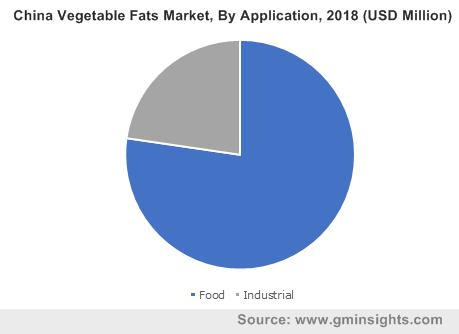 Global Vegetable Fats Market size was valued at over USD 91 billion in 2018 and is anticipated to witness a CAGR over 5% up to 2025. The rapid expansion of key agribusinesses with the development of new market strategies coupled increasing demand for several food products across the globe will propel the market share. Significant growth in the consumers’ income levels in several emerging economies, such as India, South Africa, Saudi Arabia, and Turkey, have spurred the use of different oils in food, fuel, and industrial applications. In addition, production technology advancements have increased the product supply via productive land expansions and yield improvements, which will further augment the industry landscape. Continuous shifts in the competing oil usage have contributed to significant changes in relative prices and the availability of several products. Increasing health concerns among consumers pertaining to veracious ailments, such as high cholesterol, obesity, cardiovascular ailments, and high blood sugar levels, will foster opportunities for business expansion. Besides, the incorporation of healthy diet regimes and food items due to the key benefits, such as being a rich source of omega fatty oils and good cholesterol, will drive the vegetable fats market. 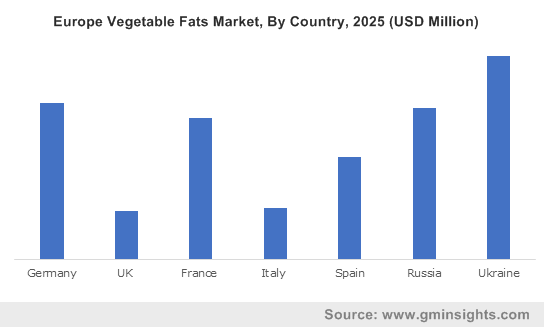 An upsurge in product usage in numerous food items production owing to the ability to decrease LDL cholesterol levels in the human body will influence vegetable fats market growth. Continuous production of oil & meal from crush processes of oilseed and soybean due to the growing demand from feed producing companies across the globe will promulgate business expansion. For instance, as per the recent trends, animal agriculture consumes over 95% of the soybean meal across the U.S. 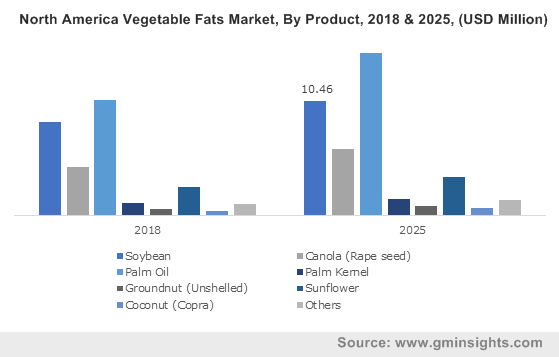 Significant adoptions made by major industry players with the use of biotechnology and traditional breeding for altering fatty acid contents in various products have substantially driven the vegetable fats market share. The incorporation of user-friendly specifications & modifications among key food products via cutting edge technological methods and new innovations have fostered numerous opportunities for business expansion. Strict government policies & guidelines regarding the proper & adequate intake of fats & oils in the daily diet plan will proliferate business growth. For instance, as per American health guidelines, the daily intake of 2 tablespoons of oil from nuts, olives, or avocadoes is considered healthy for the human body. However, fluctuating raw material prices coupled with huge capital investments may hamper the overall vegetable fats price trend. The unsaturated type accounted for over 60% share of the vegetable fats market in 2018. Growing consumers’ demand for fruits, seeds, and nuts containing high quantity of mono & polyunsaturated fats owing to the ability to lower triglyceride levels and bad cholesterol will fuel the product demand. For instance, as per daily dietary guidelines, 25% to 35% of the daily calorie intake should come from fats present in nuts & seeds. The saturated type is anticipated to witness gains at over 30% in terms of revenue in the overall vegetable fats market up to 2025. The key benefits, such as stronger bones, improved liver health, healthy lungs, and immune system enhancement, will propel business expansion. Saturated fats are obtained from egg yolks, oily fish, and plant-derived products, such as chocolate and cocoa butter, which are rich in nutrients and vitamins, thereby augmenting segment growth. For instance, as per the WHO guidelines, 10% of total calories should come from saturated fats in the daily diet. Global vegetable fats market from palm oil are projected to surpass USD 40 billion up to 2025. Palm oil is an economic & versatile product used for the preparation of both non-food and food items. Increasing product usage in several applications, such as cereals, margarine, sweets, and cosmetics, will propel industry expansion over the forecast timeframe. In addition, the key benefits such as reduced oxidative stress, improved skin & hair, slowed progression of cardiac diseases, and enhanced vitamin A levels in the body will further influence business growth. Coconut is anticipated to witness a growth of over 6.5% in terms of revenue up to 2025. Coconut is widely used for the extraction of oils & fats from tender or dried kernels, which are colorless & tasteless in nature. The incorporation of coconut oil in the daily diet accelerates the fat burning process, controls hunger, and helps in the reduction of seizures, which will enhance the segment demand in the vegetable fats market. Global vegetable fats market from food application is projected to surpass 270 kilo tons by 2025. Oils & fats are majorly obtained from fruits, vegetables, and nuts, which provide necessary & essential nutrients. Rising consumer awareness pertaining to the health benefits of omega 3 fatty acids and amino acids, which are extensively used in the preparation of several food items will propel segment growth. Besides, the rising popularity of food products consisting of nuts and fruits that contain essential fatty acids & nutrients among the young population will augment the product portfolio. Industrial applications will observe significant gains at over 5% in the vegetable fats market up to 2025. Rising consumer awareness pertaining to the growing population due to the over-consumption of fossil fuels in several manufacturing processes will stimulate the product demand in the industry. In addition, the growing need to replace petrochemical derivatives with efficient & sustainable natural alternatives will further promulgate the overall business expansion. Asia Pacific is projected to witness significant growth at over 5.5% in terms of revenue up to 2025. An upsurge in the demand for an alternative & sustainable fuel source due to the rapid depletion of fossil fuel resources will propel the market growth. Growing population, rising disposable income, and increasing consumer spending capacity in developing economies, such as China, India, and Malaysia, will enhance the industry scenario. Europe accounted for a share of more than 18% in the global market in 2018. Rising consumer awareness pertaining to significant health benefits of several oil & fats constituents obtained from nuts and seeds will promulgate business expansion. Besides, increasing consumer demand for ethnic & exotic cuisines in several parts of the region along with the growing varieties of fusion restaurants and Asian takeaways will further boost market growth in>Asia Pacific. 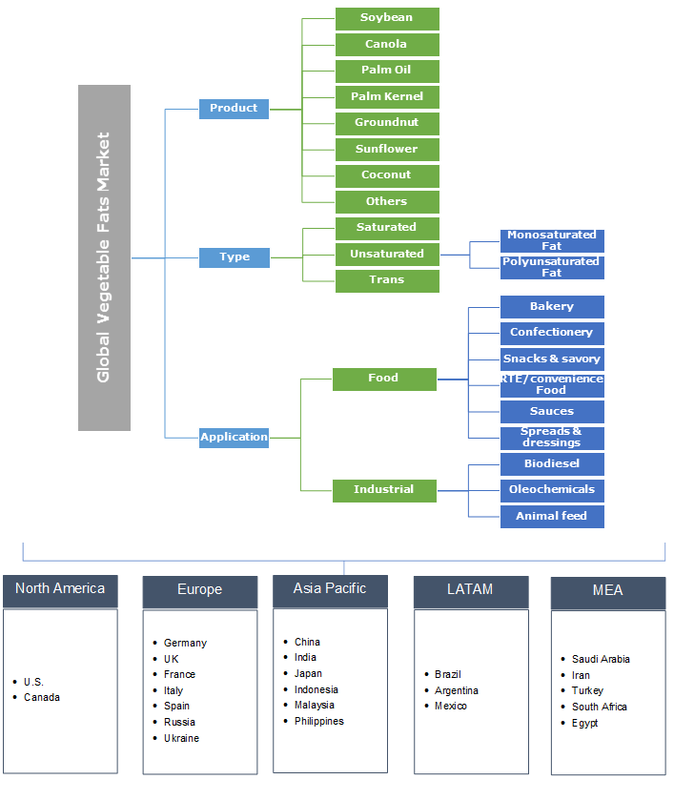 Global vegetable fats market share is highly competitive owing to the presence of dominating players such as Archer Daniels Midland Company, Unilever PLC, IFFCO, and Conagra Foods. The other notable industry participants include Carapelli Firenze S.P.A., Richardson Oilseed Ltd., J-Oil Mills Inc., CHS Inc., United Plantation Berhad, Ajinomoto.co, and Wilmar International Ltd. Collaborations. Mergers & acquisitions, product enhancements, and supply chain agreements are among the key strategies adopted by major industry players. Manufacturers are involved in supply agreements with several end-user industries along with key acquisitions and mergers. For instance, on June 29th, 2018, Archer Daniels Midland Company agreed to acquire Probiotics International, which is a UK-based probiotic supplement manufacturer, for USD 240 million. This acquisition helped the company to strengthen its position and product portfolio in the health & wellness segment. Vegetable fats are the essential nutrients obtained from nuts, fruits, seeds, and other plant-derived products. These provide effective nourishment and significant health benefits for the development & improvement of bodily functions. Modern methods for the extraction of these essential nutrients include crushing and pressing coupled with the dissolution of the crop in a solvent, which is mostly hexane. The process of Oil extraction with the help of solvents is more efficient than the pressing & residual waste left after the removal of oil is utilized for the feedstock.